Eye-catching A-Frame signs used to target foot traffic to your business. 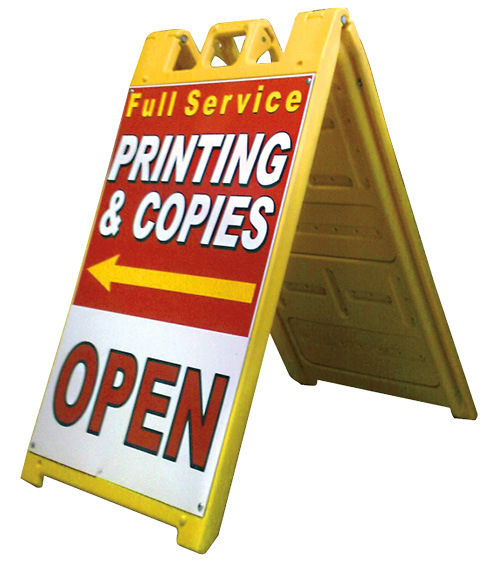 A-Frame signs are the perfect solution for outdoor signage. Tough and durable our weather resistant signs can stand up to the elements. We can create custom designed, full color inserts to attract traffic to your door. Great for letting pedestrians know you are open, what daily specials are offered or a complete menu of what you have to offer that day. A-Frames transition to indoor use just as easily. Perfect for restaurants, cafes, coffee shops bakeries, bars and other storefront retail locations. A-Frames are also a good solution for use in parking lots as directional signs and section markers. A non-permeate sign gives you the option to redirect the flow of traffic based on your current needs. Update your existing a-frame with low cost inserts. New inserts help to update or completely change the implementation. Change by the season, or even the day of the week with new custom inserts. Combined with banners, A-Frames can help produce a striking package to help bring customers into your store.